All ring sizes are declared as ring diameter. You don't know what your ring size is? Take a ring that fits you well and put it on a scale. 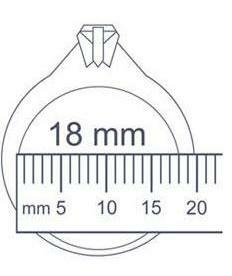 The inner ring diameter corresponds to your ring size. Our rings are wearable as stackle rings as well. If you like to wear our rings as stackle rings we recommend ordering the next bigger ring size.